This is one heck of a year for The Blinders, it is almost certainly not one Matt Neale, Thomas Haywood and Charlie Mcgough are likely to forget. Having released a sensation of a debut, their masterpiece Columbia just under a month ago things appear to have been nothing short of hectic ever since the album was released. BBC Radio support for The Blinders has been healthy. They are due to appear on BBC Music Introducing On Radio 1 With Huw Stephens this evening (Sunday). Jack Saunders of Radio 1's Indie Show gave the band a big mention earlier this week describing them as "sonically forward thinking and demands change. ", stating that "bands out there you should use that as a context and the sound of the album to feel inspired, fans out there you should be rinse and repeating it." Plus back April the band did a session at Maida Vale for Radio 6's Steve Lamacq where they played three songs. Thomas - We have been yearning for the backing of BBC Music Introducing and we have it now, it is everything that it is made out to be. It is incredible to be part of it, even if it is for a brief time because naturally they make way for newer bands and that is totally fine. There was also a string of record shop in-store live and signing dates. Keeping things real and northern the in-stores saw the band play shops in Manchester, Doncaster, Nottingham, Sheffield, Preston and Leeds. 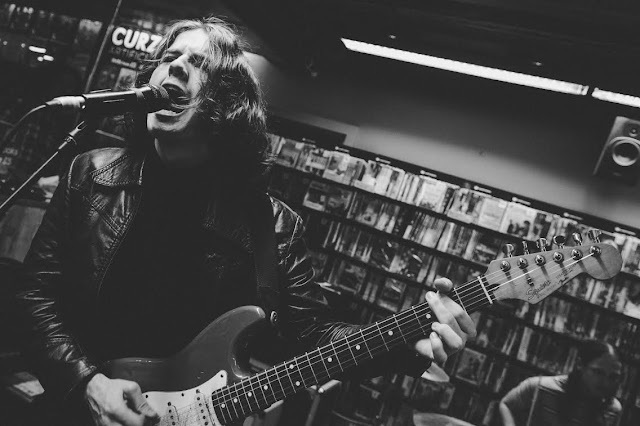 Fans queued outside Fopp in Manchester as early as the night before the event giving an idea as to how The Blinders are perceived and what could be on the cards for them. With the band's UK tour kicking off on Monday (tomorrow), a tour which will see them play 22 dates, there is little time for tranquility and probably no time for a proper rest until the end of the year. Having only just missed out on the album Top 40 is a shame but the fact that The Blinders found themselves so close is as encouraging as the sense of disappointment might be. Critically, the response to the album could not have been better with some very high ratings, a rich use of adjectives, in-depth commentary and plenty of analysis. It was almost as if a competition to write the deepest most thought-provoking album review in history had been initiated with this album. It was like who possesses the ultimate understanding of Columbia? Who is able to crack or engineer the ultimate rock 'n' roll text analysis? Who does potentially hold the key to The Blinders inner-most secrets, creative or personal? The prospect of recognition and an invisible medal in sight definitely got the creative juices flowing. Naturally, this is all positive for the greater good of music and journalism. 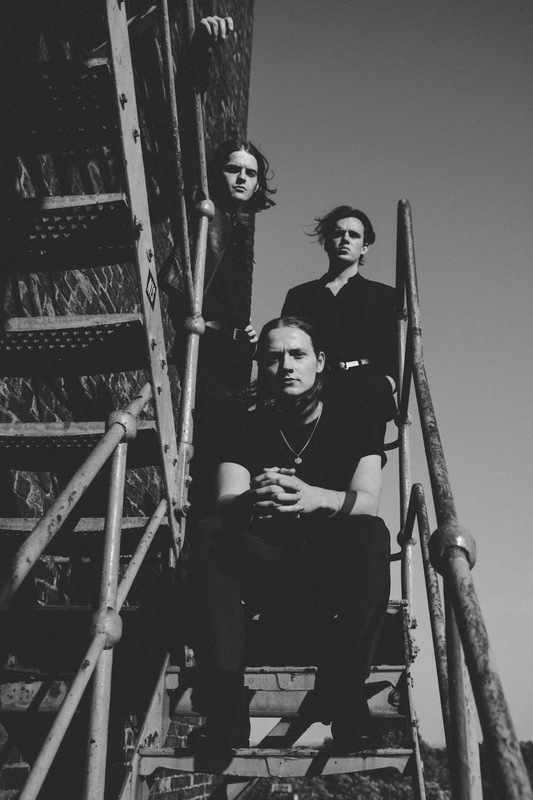 Unsurprisingly, The Blinders are not the sort of band who will sit around read and analyse every review coming their way. Subjectivity is key and it means a lot to them and while they know what their work means, they are passionate believers in the idea that everyone is entitled to their own interpretation. Thomas - It is a little difficult to read criticisms of something you have created, analysis of our work, what it means to us and what it means to other people that is entirely up to them. But of course from the brief review parts we have seen, we are really impressed. Thomas - It is a double edged sword because you are aware you should not allow any critics to change your mind about what you have made. I think we are all very confident in what we have created but at the same time it can be a little daunting to be put on display like that, you have got nothing to hide behind. It is a really interesting time and we are excited obviously. The word confidence remains key on the subject of The Blinders. Having very good songs, an enigmatic stage presence is impressive enough but the level of confidence the band project on stage and on their recordings is rare. There is confidence, ambition and a complete belief in what they are doing. Meeting the band backstage can be different to what one might expect. They come across as modest and down to earth. BBC Radio 6 Music's Chris Hawkins has known and followed the band from very early on in their career. He was the first radio host to play the band's music on a Radio 6 after he received a rough demo from The Blinders' manager. Chris - The song I heard really stood out. It hit me hard and made a big impact very quickly. It was a very rough demo that I got excited about early on. Chris - I like the fact that they are actually very modest guys who are on an interesting journey. The members of The Blinders were three kids who went to school in Doncaster and through being in a band they worked tirelessly to get to the point they are at now. That relationship they have had through the years has always been a real factor in their success, their understanding of one another, their ability to read each other on stage, it has a big bearing on what you get from their live shows and what you hear on their record. The modesty and hard work that Chris is referring to is clearly there. What also remains evident is the social conscience and genuine passion for literature and poetry. Columbia reflects the two interests and their inclusion gives the album a strong identity and depth. Charlie - We spoke about how we wanted to write about real world issues and reflect on what we have seen in the current society. We did not want to do it in a direct manner so we chose to use literature in a way to reference what was happening, create our own narrative. It is just the perfect tool for that, it resonated with us and it ended up being quite a natural process, we did not have to force it. It came naturally. But The Blinders are managing more than complexity on Columbia, it is a concept album and it offers so much consistency. Thomas - Choosing not only the order of the songs but what was going on the album was not easy. There is handful of songs that we have recorded during those sessions in Wolverhampton that don't feature on the album nor will they perhaps ever come to life, that is something we will decide on when the time comes. Thomas - By alternating between even one song and another it could have had a different sound so it was quite difficult and we wanted to leave ourselves room for the next album. We don't want the next album to be a jump and that is why there are songs on there we think are a little more leftfield as to what we would normally do but I think it has given us enough breathing room. But all the discussions and conversations were time well spent, the album offers variety and no two songs sound the same. Each song has a unique quality but all twelve songs are linked in a clever and beautiful way. There is also a use of spoken word and stream of consciousness. Charlie - We wanted to reflect the spoken word element of the band. I think there was a will to get that in there so we just thought about this stream of consciousness piece which finished off the album (Orbit) and almost feels kind of detached from it but it also rounds it off pretty nicely. The closely matched similarity between the recorded sound on the album and the one witnessed at band's live shows is quite simply remarkable. The live shows are very raw and the same counts for the album recording. Matt - That is something we were very focused on throughout the whole process, we have always had the idea of keeping it quite raw and close to the live sound otherwise you kind of lose something. Matt - We have very much been a live band up because up until now and people have not necessarily heard much of us before. It is a very conscious thing to keep the raw side of it. It is something we have kept in mind and Gavin Monaghan came in a lot there and so did Joseph Murray, Gavin's right hand man. Last month It's All Indie brought its readers an exclusive interview with producer Gavin Monaghan, the piece explored his career and daily work as a producer. Fully grasping the band's live sound, translating his understanding integrating it with the recording of the album, the producer had a huge impact and helped the band achieve the incredible sound. Chris - They are up there with the potential to grow into the kind of band that Idles have become, they are not as politically charged but they are very socially aware. The album is a concept album, which is brave, but it has been done in such a way that you can take in the concept or just let the tracks stand alone and view them as individual songs. It is quite hard to achieve but either by design or by luck it is as much a continuous listen as an album of individual songs. Thomas - Our new songs for the second album are very primitive at the moment. We like to sit on our songs for a while. Our song Brutus for example took us nine months to actually arrange and define so I would imagine that we will be doing that with the current demos that we have. If we were to talk about them now it would be futile as they will change so much until we get in the studio. Wolverhampton may have its limitations when it comes to coffee shops and other amenities but hopefully The Blinders will continue to work with Gavin Monaghan at his Magic Garden Recording Studio and there seems to be a fair chance that the creative partnership may continue. Thomas - We would like to work with Gavin again. We are always sending him bits and pieces and I imagine we will be sending him demos too. We are intending to get on with this UK tour, have a break and then go into the studio. Being signed to a record label definitely helps. ModernSky UK has provided the band with funds and a base so they can release music and that is obviously useful. Thomas - Our label has given us a platform, what more can we ask for? They have not encroached on us creatively in ways which perhaps would have been different with a major label. We are very happy with what we have created in Columbia. The band want to stay in Manchester, they love it there and feel at home. Of course Doncaster is part of who they are as people, where they started out as musicians and The Social Bar was where they played some of their early gigs. It is tempting to assume that Doncaster is where the modest and down to earth side of their personalities derives from. They have such a great sense of humour as well. Thomas - I think there is a weird thing about everywhere up north not being very nice but we had a good upbringing and we all knew each other at school. We had some really good times and Sunday league football was a highlight, that was one of the things that we got up to. It was great. Charlie - It has shaped us and I think the venues that we played certainly helped form the sound we developed. I think in that sense, had we lived in a different town we might have ended up making a different type of music but our music is not the sound of Doncaster and it does not define the town. What path is the trio looking to follow in the future? We are probably just going to have wait and see. Thomas - Time changes everything. We probably won't be able to comment on it now because we will be very different people in a year. We are always about progress and about shifting the sound in ways which suit our minds so to talk about it now would be futile. We don't know what it is going to be like but we know it will be good." 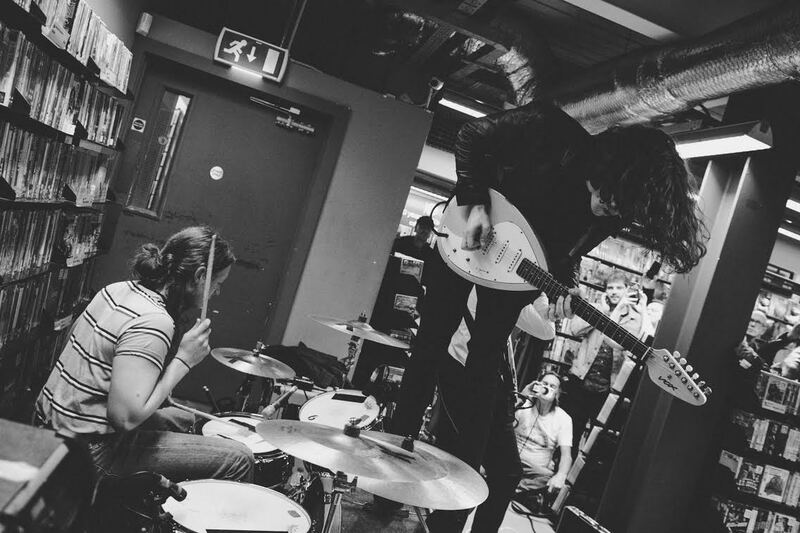 Musically, it remains obvious that The Blinders offer a different perspective and sound. Chris - Guitar music very much has a healthy future. I saw The Arctic Monkeys in Manchester Arena recently and I watched in awe. I thought about where we are in music right now and the real rise in UK R&B, garage and hip hop and that dominates music radio but The Arctic Monkeys are absolute proof that there is a future for guitar bands and The Blinders are leading that new wave. Chris was hosting a show at Kendal Calling this summer and he had asked the band to drop by and take part in an interview on stage in front of a live audience. Two hours before they were due to appear someone asked if he wanted them earlier but they were not due until midday. For Chris it was unusual to see a young band turn up so early.